Crow has hosted a variety of workshops designed to encourage community building and interdisciplinary collaborative work among writing scholars. Our goals are twofold: (1) Help teachers integrate data-driven approaches into their classrooms by demonstrating the numerous contexts in which our corpus tools and database can be used for teaching writing; (2) Promote writing research by sharing our pedagogical materials with other scholars. In addition to the materials below, please visit the Crow platform for more how-to documents, screencasts, and other support! We are planning workshops for summer 2019 at Wright State University in Dayton, Ohio, and have conference proposals which include workshops as well. 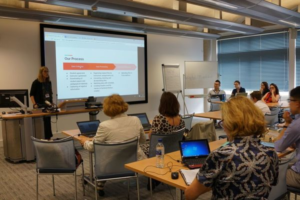 This workshop was conducted at the 2018 TALC (Teaching and Language Corpora) conference in Cambridge, England. For the first time, Crow members debuted a working prototype of our platform. Participants were able to interact with our online interface and provide feedback upon completion of delegated tasks, such as exploring the search and filter functions in our repository database. Shelley Staples debuts prototype of online interface. This workshop, given at the University of Arizona, demonstrated the uses of Word and Phrase, a digital tool which searches for the frequency of words within a text. Our Word and Phrase Handout provides a detailed explanation of how it functions and the various ways it can be used by professors and research scholars. 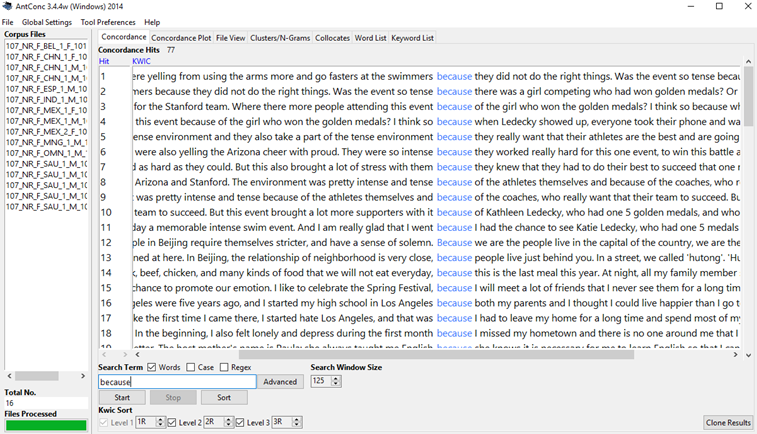 Word and Phrase tool in use. The Arizona Crow team continued its series of workshops focusing on AntConc, a freeware corpus analysis toolkit developed by Laurence Anthony, with this workshop, given at the 17th Annual SLAT Interdisciplinary Roundtable. Crow researchers demonstrated how to search for N-grams and use concordance functions within AntConc. Our AntConc Handout lists helpful tutorials, useful terminology, and practice activities for using AntConc. The Arizona team hosted a workshop for instructors which demonstrated how to use AntConc, mentioned above, in several teaching contexts. Instructors were encouraged to consider citations and several other elements of writing in connection with language awareness. This workshop, given at the Computers and Writing 2017 conference, shared group communication strategies that research teams can implement to support joint decision-making and sustain long-term research. Participants were able to learn best practices for interdisciplinary collaboration, specifically addressing differences in communication and research methods among different disciplines. This workshop was given to prepare Crow members for a more advanced training led by a professional programmer. The workshop consisted of three sections. The first section focused on tools installation, i.e. installing Python in Visual Studio; the second section explained the basics of Python programming, such as string and list variables. The last section was based on a hands-on activity, which provided the participants with a chance to write a simplified “tokenizer” on their own. Workshop led by Ge Lan and Tony Bushner. This workshop, given at Purdue University to the English Department, focused on how to use Corpus of Contemporary American English for research and pedagogical purposes. We specifically focused on introducing writing instructors to the basic and advanced interface functionalities: searching for collocations, using KWIC, comparing the use of lexical items across registers (speech, academic writing, newspapers, etc.). Slides and handouts from the workshop are available.